Serving Long Island, New York City, Queens, Brooklyn, Nassau, and Suffolk	Counties and travel to other areas! 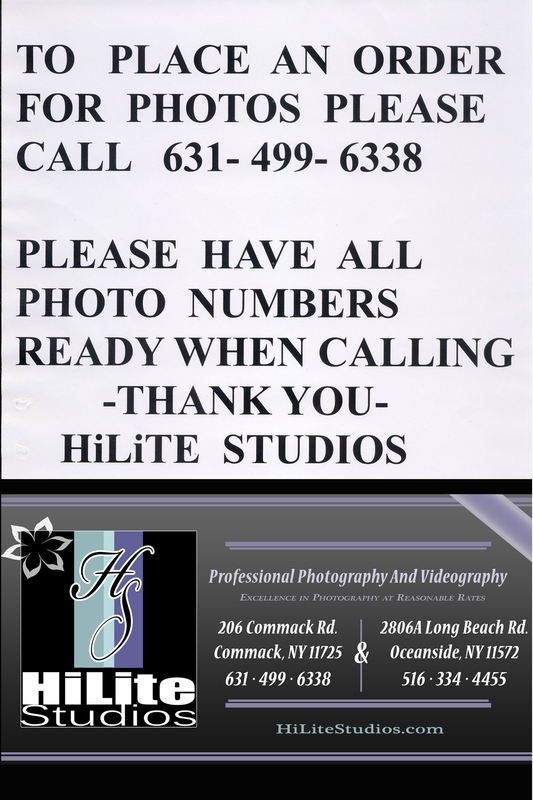 For more than 25 years, HiLite Studios has provided the highest quality	photography and DVD Video services to the people of New York. As Long	Island and NYC photographers, we use our experience to bring people the	joy of lasting memories through photographs and videos of their special	occasions. From weddings, to Bar/Bat Mitzvahs, to Sweet 15’s and 16’s	and more, our memory-making services can cover all your events and special	occasions. To schedule a free consultation by phone or in person call	us at 631-499-6338 or 516-334-4455 or email us anytime. With storefront locations on main roads in Oceanside and Commack, we are	easy to find. You can stop worrying about finding an experienced and reliable	photographer—trust us to do the job! We can provide you with pristine	photographs, studio portraits, or DVD videos of your special day with	memories that you will cherish forever! With three generations of highly recommended Long Island and New York City	photographers and videographers, our staff is well trained and ready to	help you create lasting memories of your special occasion. We have the	experience to capture the powerful, spontaneous, and romantic emotions	that surge through all of us during those special moments; emotions that	are often missed by less experienced photographers. Our staff is highly trained and knows how to get you to “be yourself”	in front of the camera. We want you to feel comfortable and to thoroughly	enjoy yourself. You can trust us to provide top quality service and products	so that you can cherish your memories forever. With us, you can rest assured	that the memories from your special occasion are in good hands! We understand how important it is to have the highest quality photographs	and videos of your special day. To us, these are not just photographs,	they are your treasured memories, and we use state-of-the-art digital	equipment to ensure that you are 100% satisfied with our finished product. Excellence in photography at reasonable rates! Our team wants you to enjoy your special day and we strive to provide you	with the best services and products so you can relax and focus on having	a great time. Don’t trust your special occasion to a less experienced	photographer. Choose us to capture your special moments so we can provide	you with memories that can last a lifetime! Contact us today at 631-499-6338 or at 516-334-4455 to schedule a free consultation.